Funded by the European Commission under Erasmus+, the ESSA-Sport project will last 36 months starting from 1st November 2016 until 31st October 2019. The need for an ESSA-Sport was demonstrated in a recent European Feasibility Study undertaken in 2014 by EASE, UNI-Europa and EOSE and funded by the Directorate-General for Employment, Social Affairs and Equal Opportunities under the Sector Skills Council initiative. ESSA-Sport strives to deliver the first Europe-wide Employment and Skills map for the whole sport and physical activity sector – a sector of huge economic and social significance where new businesses and jobs are being created and new skills are needed to match the expectation from the labour market. 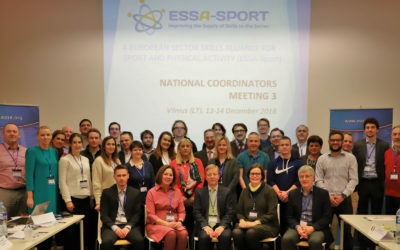 ESSA-Sport project provides a unique opportunity to undertake the first analysis of the labour market and skills needs and to create the conditions for change in the sport and physical activity sector. The aim of the project is to improve the supply of skills to the sector. To be successful we encourage all interested stakeholders from the sector to get engaged, express their views and support the initiative. Have your say to influence the future direction of the sport and physical activity sector! Desk research , the first EU-wide skills survey and series of consultation activities in all partner countries.